10 *Gorgeous* Lehengas To Inspire Your Sangeet Style! If you thought your wedding lehenga is the only outfit you’ll spend weeks to find… we’d like to tell you that it’ll be just the same when you’re finding your sangeet lehenga! After all, this is one outfit you can totally go all out with - no rules attached! From colours to cuts and trendy designs, there is just so much to experiment with. 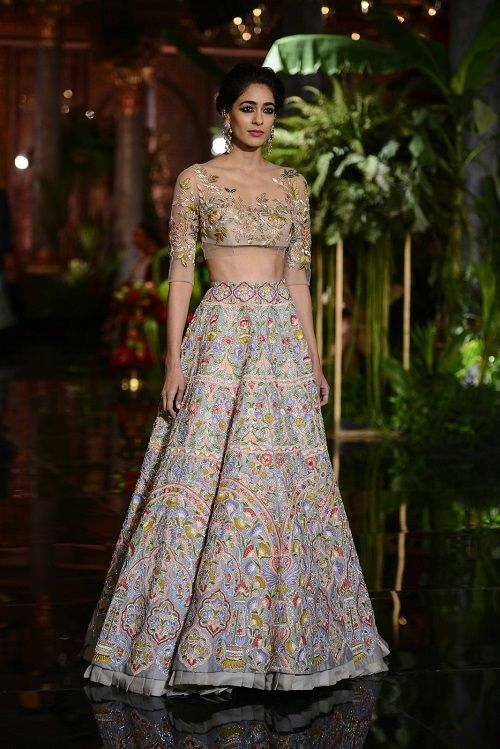 And to get you started, here’s a peek into our favourites from last month’s FDCI India Couture Week. It’s all the sangeet inspiration you need! 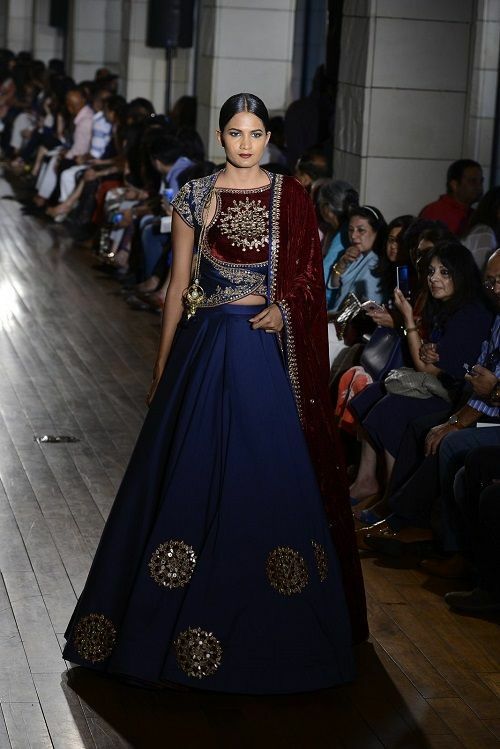 A blue and maroon lehenga, this one’s for the bride who wants to look like absolute royalty at the sangeet. 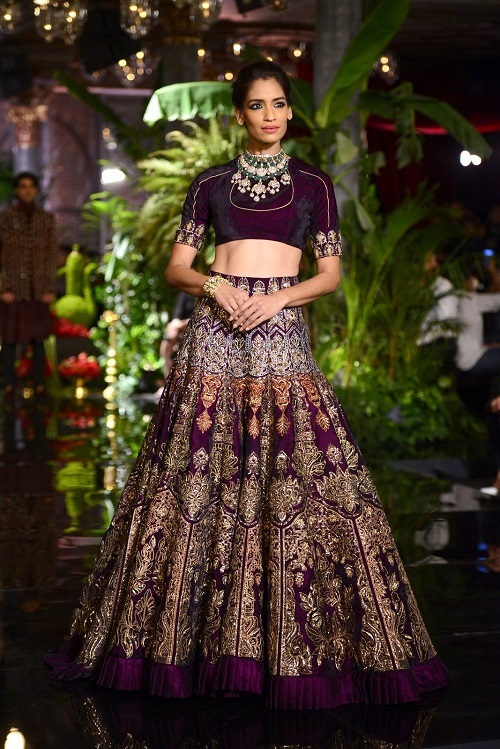 We love the heavy velvet dupatta and the voluminous lehenga skirt that’s just so stylish! Perfect for a winter sangeet function. Traditional with just a bit of raw sexiness, this one’s a perfect pick for the bride who loves wearing black. 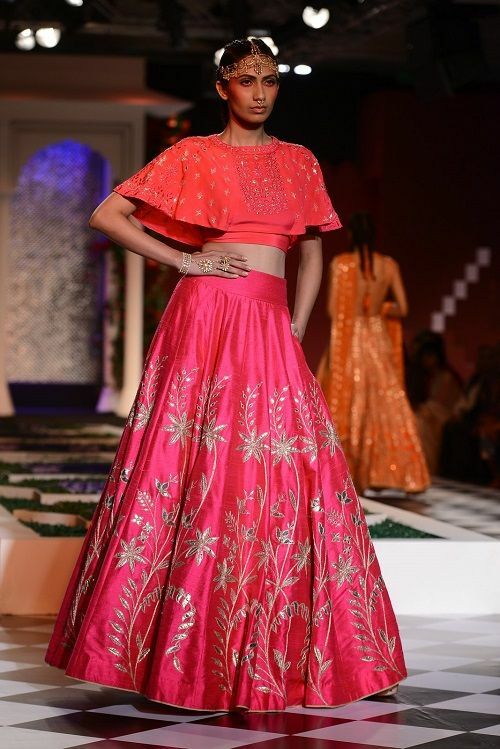 The pleated lehenga, the full net sleeves and the waist belt give this piece just the right amount of edginess. 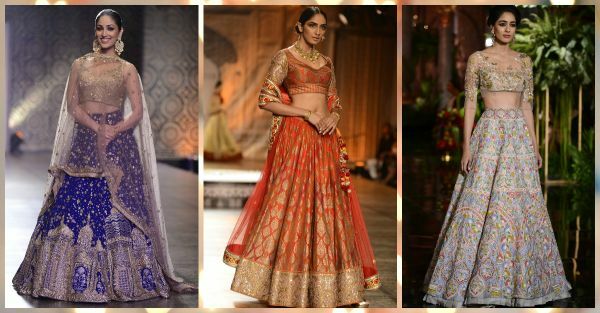 The Last Dance Of The Courtesans by Tarun Tahiliani Also read: 7 Stunning Bridal Outfit Styles For The Modern Bride-To-Be! 4. The fun summer bride! We’ve been seeing so many brides wear white at their wedding that we just had to show you this stunner by Manav Gangwani. A beautiful white lehenga with intricate embroidery, this one’s just so majestic. Dressed in a gold choli and a midnight blue lehenga, actress Yami Gautam makes quite a statement as she walks the ramp for designers Rimple and Harpreet Narula. The architectural motifs and the scattered booti work add all the glitz and glam to this one. 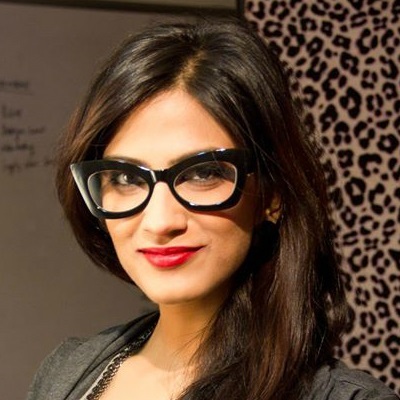 Hiraeth by Rimple & Harpreet Narula Also read: 8 Indian Designers Who Are *Perfect* For The New-Age Bride! 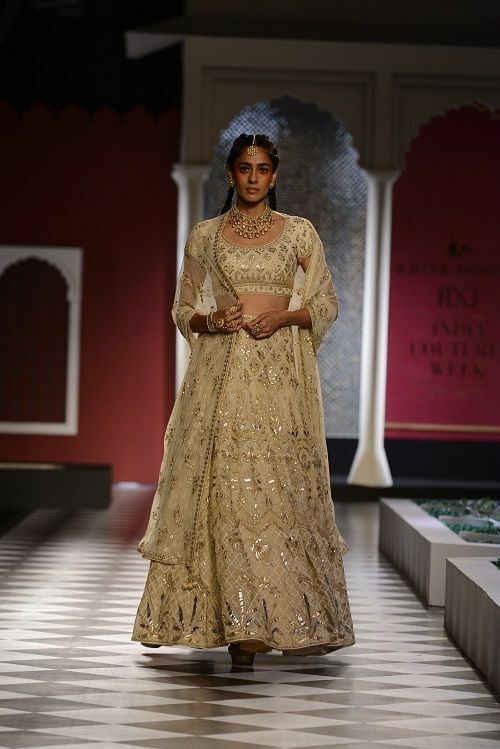 A trademark gota patti lehenga by Anita Dongre, this off-white creation is absolutely mesmerizing. 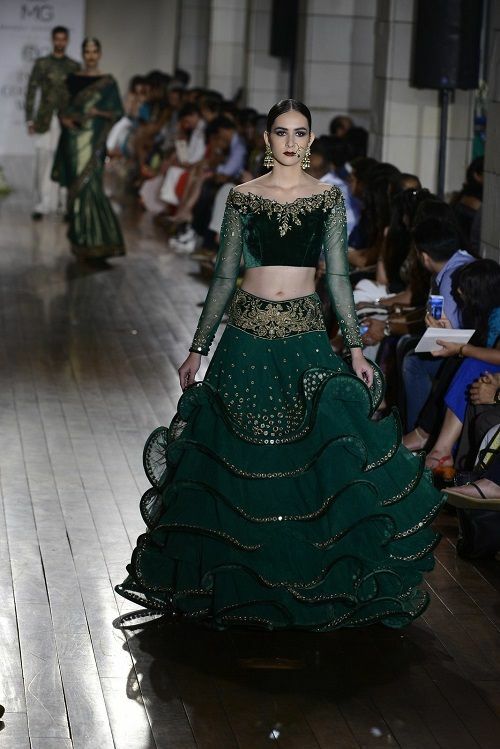 We love the delicate and feminine work and the flattering silhouette of the lehenga. You can’t go wrong with this one, ladies.